For those unable to attend in person, you can find listen to our Sunday School class from the Auditorium live on 102.1 WLCT from 9:00-9:45, and our Sunday morning worship service from 10:15 to 11:00. You can find our previous sermons and weekly bulletins with the sermon outline by clicking here. 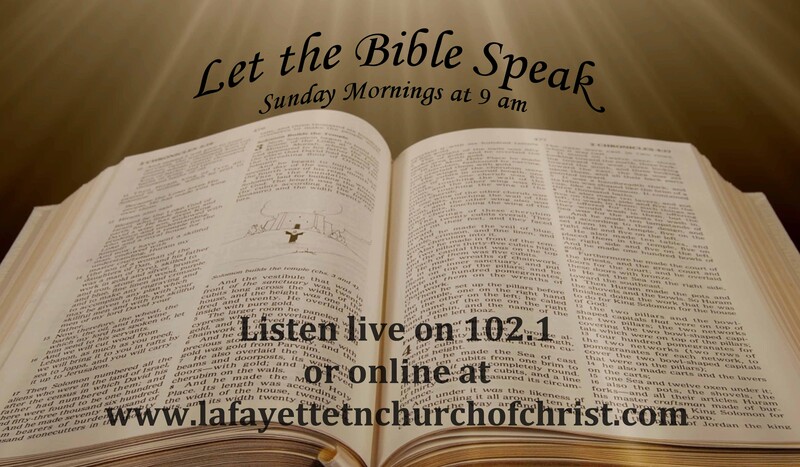 For those unable to attend in person, you can listen to our Sunday School class from the Auditorium live on 102.1 WLCT from 9:00-9:45, and our Sunday morning worship service from 10:15 to 11:00. Please see the weekly bulletin and events calendar for all events. Our gospel meeting will begin on Sunday, April 7 and continue to Wednesday, April 10. Our speaker is Red McCaskill, president of Freed-Hardeman University at the Dickson campus. Services on Sunday, April 7, are: Sunday School @ 9:00 AM, Worship @ 9:55 AM, and Sunday Evening @ 6:00 PM. Services on Monday, April 8, to Wednesday, April 10, will begin at 7:00 PM. Please join us to learn more about God and help spread His word. We will be having a "Shadow of the Cross" service on Friday, April 19 at 7:00 p.m. This service will consist of songs and scripture reading around the theme of the cross. The purpose is to help us prepare our minds for Easter. Due to circumstances beyond our control the church directory is still a work in progress. Thank you for your patience. The American Red Cross Bloodmobile will be here on April 8 in the fellowship hall from 12:00 p.m. to 5:00 p.m. The American Red Cross is always in need of blood donors. Please make arrangements to give the gift of life! You can now listen to our entire Service live online by clicking HERE. Sunday School 9 AM, Sunday Morning Worship 9:55 AM, Sunday Evening Worship 6 PM. Wednesday Evening Bible Study 7 PM. If you are unable to attend, we invite you to listen live.